We encourage and recommend our fellow travelers to backpack and travel light which will avoid those pesky airline baggage fees; or just plain easy-to-carry-bags around while they experience the majestic places. But if you decide to drag those suitcases around then you have experienced the trouble of lifting it out of that baggage claim belt or on the bus from the airport to the metro center. Some metro stations like the London Tube or New York Subway have staircases instead of escalators that make you carry that heavy suitcase up about 20-30 flights. Most suitcases these days have two handles – one on the horizontal side and one on vertical side – and it may not be the best way to carry. So what do you do to make your life and hands easy? 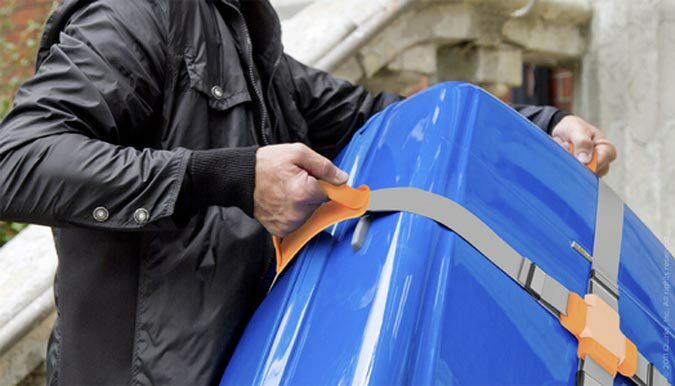 You get the Lift – an adjustable, heavy-duty, nylon t-strap that wraps around your suitcase that has extra handles located all over the strap. Quirky invented this product that attaches with plastic seatbelt-like buckles so you can easily pop it off for inevitable luggage inspections. Quirky is taking pre-orders now and Lift is currently available for pre-sale for just $24.